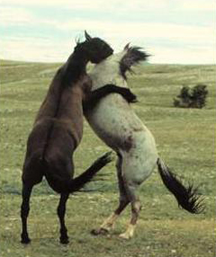 Mustang stallions fighting. With tooth and hoof, stallions use these fights — most often — to settle differences of opinion about reproductive rights. The mares usually accept the result of these conflicts, though they do occasionally object. The social system of the wild horse functions to optimize the fitness of the next generation, because in Nature, there's little room for anything less than the best. Organizations can learn much from Nature's systems. Photo courtesy U.S. Geological Survey. The mythology about best practices is that they universally improve every organization. The truth is more likely that organizations are so idiosyncratic that any practice born elsewhere probably needs tailoring before it can be imported. My old shoes are very comfortable for me, but they probably aren't for you. Worst practices are different — they're almost universally disastrous. We know this because, sadly, nearly everyone tries them. Here's a short list of some worst practices. Provide only outdated equipment. Even better: make people share outdated equipment. Use training as a reward. Provide it only to those who need it least. Would you like to see your comments posted here? rbrenUSBnLURzqdCHnNQMner@ChackjHrZWgOBKSZstCooCanyon.comSend me your comments by email, or by Web form. I offer email and telephone coaching at both corporate and individual rates. Contact Rick for details at rbrenKINHDCYtzalxHtZnner@ChacwcqdMzLQcrztbLecoCanyon.com or (650) 787-6475, or toll-free in the continental US at (866) 378-5470.